Quilting is Judy Doenias's second career following 26 years working. Judy joined an already in session hand piecing class in 1987, and began working on an as of yet still unfinished queen size quilt. Nevertheless, Judy was off to the races and two years later, was teaching quilting! 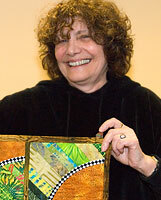 Today, Judy teaches at several quilt stores as well as at various guilds and quilt shows. She teaches just about every technique except appliqué - she leaves that up to Diane Rode Schneck! Judy was President of Empire Quilters in 1991 and a past member of the Manhattan Quilters. She is the proud owner of seven sewing machines and three cats.